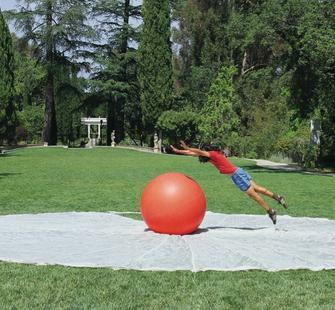 Friday, June 27, 2014, 6 p.m.
Join us as we celebrate the opening of Fun & Games: Six Artists Consider Play and Wellbeing, Montalvo’s 2014 Art on the Grounds program, with an art party featuring live music, a DJ, and food trucks. Performers and composers Chris Chafe, Luciano Chessa, Ellen Fullman will ‘play’ participating artist Terry Berlier’s This Side Up, Handle With Care sculpture as well as other natural and manmade elements on Montalvo's grounds. Ana Gallardo and her dancer collaborators will host free Danzon (Cuban dance) workshops. Miguel Arzabe will organize games on the lawn, while Michael Hall will lead an obstacle course that incorporates painterly aesthetics. Don't miss the photo booth on the veranda provided by TnT Photo Booth! Take an awesome picture, add a message to it, and share on social media using #RockTheGarden! Fun and Games is organized by the Lucas Artists Residency Program. The last exhibition coordinated as part of Flourish: Artists Explore Wellbeing—Montalvo’s multi-year programmatic theme focusing on health and wellness—it is made possible thanks to the generous support of: Anonymous • AeroMexico • Barry and Jo Ariko • Bay Area Canvas and Awning • Consulate General of Mexico, San Jose • Honor Fraser Gallery • Ann and Gordon Getty Foundation • William and Flora Hewlett Foundation • James Irvine Foundation • National Endowment for the Arts • David and Lucile Packard Foundation • Brandon Pfarr • Myra Reinhard Family Foundation • Stanford University’s Department of Art and Art History and the James and Doris McNamara Faculty Fund. Special thanks to Valeria Garrote, Marina MacLatchie, and Jia Gao.